Please implement a feature that shows the latest added projects. Just about every other software listing or hosting site (sourceforge, freshmeat, github, etc.) has this feature. 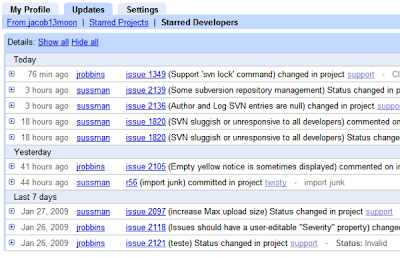 Subscribing to an RSS feed of the newest projects would be ideal. But you know the problem with that, targ? You will find a lot of projects which are just named and empty. Visiting them will make you depressed as not to come back and check again. Well, disclaimer: I am not from Google, the above was just my personal opinion. A new and (almost) empty project is an opportunity to join at its inception, a chance to do great things. When will Git be available? Would be nice to have a gadget for bloggers with some graphic statistics about commits... something like a time line a bar for each month. You can use ohloh.net for that fabio, however it would be nice to see some in project graph. Also I support the suggestion by targ, I would like to browse some other projects, witch are new, but active.